The lines are getting blurry, but we don't quite have autonomous robots that are meant to injure or kill people as part of their job*. The machines pictured here are teleoperated, but it's easy to picture that in 20 years we'll see images just like these except that humans will no longer be part of the control loop. So get ready for the future. 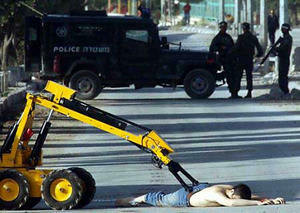 An Israeli police robot checks the body of a dead Palestinian man for explosives. Another robot checks the same man. 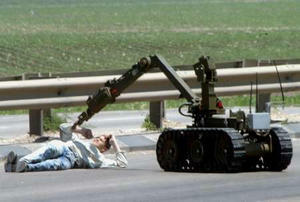 An Israeli robot drags a critically injured Palestinian suicide bomber whose bomb exploded prematurely. 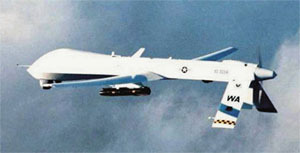 An unmanned Predator aerial vehicle, armed with laser-guided Hellfire missiles. Armed Predators are flown by the CIA (and have been used heavily in Afghanistan), which first deployed armed UAVs in Vietnam. * Though accidents happen, of course. 1981 had the first documented case of a person being killed by a robot; a repairman was pushed into a grinder in a japanese factory. The grisliest case I read about was one where an engineer was pinned by a robot when a production line unexpectedly started up, and molten aluminum was poured on him. "An Israeli robot drags a critically injured Palestinian suicide bomber whose bomb exploded prematurely." I realize he may be a suicide bomber, but is it wise to drag critically injured people? 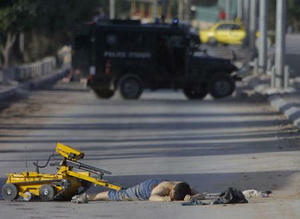 The police thought he was dead until, after the robot started dragging him, he began to kick at it. Not that I think the police would have handled it much differently if they'd known he was alive. And I think I have to agree; If there's any chance of more explosives waiting to go off, I think sending in the robot is probably the right thing to do. Dan Moniz, it seems to me that the most likely alternative to having the robot investigate him might be to cordon off the area, and wait to see if he explodes some more. My impression is that in the event of an explosives misfire, there's a possibility of further explosions during the next few minutes or so. If he's critically injured, he might very well die during the wait. I don't know why he would be "dragged"; the picture looks to me like the robot might be rolling him over, so the authorities can see what might be hidden under him. For that matter, one of the steps in evaluating an accident victim is to roll him/her (after suitable precautions to avoid spinal injury) to see if there are any more urgent injuries beneath the victim. If you've got an injured suspected bomber, two important things to determine are, how dangerous is he, and what are his injuries. Using a robot to roll him over might help evaluate both questions with minimal danger to the other people involved. it won't be long now till our corporate overlords deem that human bodies are technically hazardous waste, and all dead bodies are handled by large, sterile robots. big up the overlord oppressorman.